Something of a journeyman during his playing career, Ian played with Queen's Park, Dunfermline, Rangers, Bradford City, Dundee, Falkirk, Hamilton Accies and Partick before retiring as player/manager at Clydebank. He spent 3 years at Clydebank, then moved on to Morton for a short spell before becoming the Airdrie manager in 2001. He would remain manager until the club's extinction in 2002. It was at Falkirk that McCall would attract the attention of United Chairman Eddie Thompson, having guided the Bairns to the First Division trophy in 2003, losing only 3 times in 27 matches as manager. After several unsuccessful attempts to convince McCall to take the United job during the first half of the 2002/03 season, Thompson finally got his man in January 2003, and over the next 4 months he helped steer United clear of relegation. In his first full season at Tanandice he guided United to their first Top 6 finish in the SPL since the introduction of "the split", finishing 5th in the table. During the club's push for the placing that season, he was awarded the Manager of the Month award for April 2004. 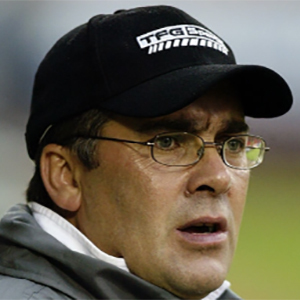 The following season was to be McCall's undoing however, as in March 2005 he was removed from the position of manager with the club sitting in the bottom half of the table, ultimately replaced by his former assistant Gordon Chisholm.